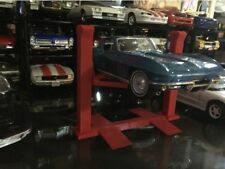 1/24 1/25 Scale Model Car Lift | Two Post Lift | Twin Post Lift | 3D Printed! Item:Decal Set - McDonnell Douglas F/A-18A/A /B/C Hornet. This set includes markings for 6 DIFFERENT U.S. Navy aircraft! This set also includes a set of Paint Masks for the Canopy! Laser cut acrylic display stand for the Zvezda & Revell 1/2700 Star Destroyer (the big one!). This set includes Stencil markings for FG.1/FGR.2 Phantom II jet fighters in Royal Air Force service! Item:Decal Set - de Havilland D.H.82 Tiger Moth - Spanish Republican Air Force. This set includes markings for 3 DIFFERENT Chinese Canton Air Force versions! This decal set ALSO includes a set of resin wheels! I've created this set of paint masks for the 1/144 Bandai TIE fighter/ tie advanced set. This set of pre-cut masks makes painting super easy with crisp, sharp lines. Includes masks for the wings of both tie fighters plus their canopies. Item:Dornier Do-18 Flying Boat Transport Carriage. The set includes resin parts and assembly instructions. This kit is suitable to be used with the 1/72 Revell or Matchbox model kits. Item:Decal Set - U.S Propeller Logos and Stencils. This set includes Logos for Hamilton Standard, Curtiss Electric, and Aeroprop! This kit is COMPLETE and MINT IN THE BOX! This set includes resin parts and instructions. The box is in good condition. Condition:NEW - MINT IN THE BOX. Item:Blossom V-2. This injection-molded model includes parts molded in gray plastic, resin nose cone, a sheet of decals, and assembly instructions. This box is in good condition. Item:Decal Set - Republic F-105D Thunderchief. This set includes 5 sheets of photo etch parts and a sheet of clear acetate details as shown in the photos, plus instructions. Item:Lockheed C-130E/H Hercules Engine Set. This set includes resin parts shown in the photos plus instructions. The box is in good condition. This set is COMPLETE and MINT IN THE BOX! This set includes 4 Engines and 4 Propellers! Item:Decal Set - Republic P-47D Thunderbolt. Item:Napoleonic Prussian Infantry Marching. The box is in good condition. Item:Lockheed C-130 Hercules Propellers Resin Update Set. This kit includes the parts shown in gray in the photos. The actual parts included are shown in the last photo. This set includes four propellers. Item:Decal Set - Boeing KC-97 Stratofreighter. This set includes markings for 10 DIFFERENT U.S. Air Force tanker and transport aircraft! Item:Riveting Tool. The set includes one Riveting Tool. This tool is designed mark rivet lines in 1/72-scale. The kit includes parts molded in gray resin and assembly instructions. Item:Decal Set - McDonnell Douglas A-4 Skyhawk. Item:Decal Set - U.S.A.A.F. Insignia National Markings "Stars & Bars". Markings are included for 5 DIFFERENT styles of Insignia. This kit includes the parts shown in the last photo. Item:Mil Mi-24 "Hind" Engine Resin Accessory Set. This model is NEW and MINT IN THE BOX! The kit includes parts molded in gray resin. The box is in good condition. Item:Decal Set - Republic F-105 Thunderchief. This set includes markings for 7 DIFFERENT Silver U.S. Air Force aircraft that flew in Vietnam! Item:Sikorsky S-51 - H03S-1. This injection molded kit includes parts molded in light gray, a tree of clear parts, a nice sheet of decals with markings for U.S. Navy and French Navy versions, and assembly instructions. Item:Spartacus Army. The box is in good condition. Item:Colonial Marines. The kit includes parts molded in gray resin and assembly instructions. Model Truck Suzie Coils Air Lines, these will work great on all model trucks. They will stretch out to hook to a trailer on leave them compressed. 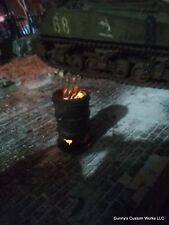 They work best on 1/25 or 1/24 scale mode trucks. There are not any glad hands or connectors for them. Item:Decal Set - Sepecat Jaguar GR1A. This set includes markings for 3 DIFFERENT British aircraft including aircraft from No.6 Squadron (this squadron has the distinction of the longest continuous service in the Royal Air Force!). (Ice Age Scrat), made by RetroKits Models. This kit is COMPLETE and MINT IN THE BOX! The finished model will be about 2" tall and 3-1/4" long. Item:Love at First Sight! The kit includes parts molded in gray resin. Item:Decal Set - Fiat BR.20 Type 1 "Ruth" Over China Part 3. This set includes markings for 4 DIFFERENT Japanese Air Force versions! Item:Arado Ar-196 Floatplane Transport Carriage. The set includes resin parts and assembly instructions. Item:Arboretum forU.S.S. Enterprise from Star Trek, made by Green Strawberry Models. This kit is COMPLETE and MINT IN THE BOX! This set is designed to be used with the Polar Lights 1/350U. S.S. Enterprise model. Item:Resin Set - Handley Page Halifax Radiator and Propeller Correction Set. The set includes resin parts and assembly instructions. Item:Hanger Crew #2 - A-Wing and Y-Wing Pilots. This kit is COMPLETE and MINT IN THE BOX! This set can be used with any 1/72-scale Star Wars models and includes A-Wing and Y-Wing Pilots. This set includes resin parts and instructions. Item:de Havilland DH-82 Tiger Moth Rigging Wire and Wheel Set. This set includes the resin and photo etch parts shown in the photo in front of the aircraft. This set includes the resin and photo etch parts shown in the photos plus instructions. This set includes markings for Seakings that recovered spacecraft from FOUR Apollo Missions, including Apollo 8, Apollo 10, Apollo 11, and Apollo 12! Item:Decal Set - Sikorsky Sea King "Old 66", Apollo Mission Recovery Helicopters. Item:Decal Set - Lockheed EC-121 Warning Star Part 1.